Quick Brake Question - Miata Turbo Forum - Boost cars, acquire cats. This particular kit is to use sport brake rotors while retaining the rear calipers and pads. I was reading the description and it seems like it's only recommended for aftermarket brakes. I'm swapping to sport front brakes on my nb1 and it seems that the larger rear rotors aren't recommended for these. I'm just curious what you've found that led you to this conclusion. Does having the larger rear brakes throw balance off? Since the sport brakes themselves are larger in the rear, are those more 'unbalanced' than the 1.8s? I own that kit and it offers great balance when used with the 11.75 front kit. Rear braking was inadequate prior to adding it. That's an anecdote of one, but that's all I have. Do sport and non-sport equipped miatas use the same bias valves from factory? I was talking to Ryansmoneypit about getting better brakes as I boost the car and his rec was to get front sports and use the adapters on the rear. You're doing things as they recommend and he had good experience with balance doing it with the sport fronts. I've read that the full sport setup can make braking a bit sketchy at speed since the rears have a bit too much bite and lock up easily, but I'm not certain on this. I was mostly curious what the rationale was to not use the bigger rotors with the 1.8 brakes (instead of sport brakes) with sport fronts. I thought you'd take some of the bite out to even out the braking, but gain the advantage of better heat dissipation due to the larger rotor area. I think the master cylinder is different. I'm keeping mine because I want more feedback instead of less pedal travel (no abs). I'm not sure about the bias valve. I honestly haven't seen that come up anywhere I've looked, but I can keep digging. I also wasn't specifically looking for that information so I might have glazed over it. FM suggests that the NB1 was similar to the years before it and it changed in 02. Looks like the knee point is lower for the non sport vs sport, so I think the bias valves are different. If the assumption that the nb1 is similar to the 94-97 holds on FM's part. If it is a track car you should have an adjustable proportioning valve regardless of what brake combination you have. and yes, rear sport brakes work best when paired with 11.75 front. I thought when I did my upgrade , that for the rear, the sport rotor with the non sport caliper was the preferred track choice? I thought that the sport caliper having a small pad selection was the driving force for the smaller non sport caliper. Was I wrong? It's not quite a track car yet, but I might look into the valving anyway. So is the sport front better mated to the 1.8 rear on stock rotors? Read my post and E's answer. Looks like I had it wrong and that it should be sport all around with a brake bias adjuster. How in the hell did I come up with my original answer?? But he said in the post I quoted above that rear sport brakes work best with 11.75 fronts. I think the sport fronts are about 10.6 or so, a half inch larger than the 1.8 fronts. Emilio, are you saying that the full sport setup is best kept together with a proportioning valve to reduce the rear bias? I thought he was pretty clear and/or has been clear in the past. 11.75 front Wilwood setup, a prop valve, and sport rear rotors is the balanced good combo. Whether you use the sport rear calipers or the standard 1.8 rear calipers with the extra bracket is up to you and what kind of pad availability and pricing you can live with. Do you want to hear it said that you can use the regular sport brakes all the way around and have it be wonderful? It won't happen. That's why we spend the money on the 11.75 kits. If the stock sport stuff was adequate no one would have bothered to develop the multiple different 11.75 Wilwood kits on the market. We as Miata owners aren't known for spending money on things that are already good enough and the small niche shops for our cars aren't known to waste development time and money for things that are already good enough. Therefore, extrapolate that this is the best way or we wouldn't be doing it. This rear kit allows you to install 10.84" Miata factory Sport Brake rotors to replace the smaller 90-00 OEM Miata rotors. It is only recommended for use with our 11.75" front BBK. 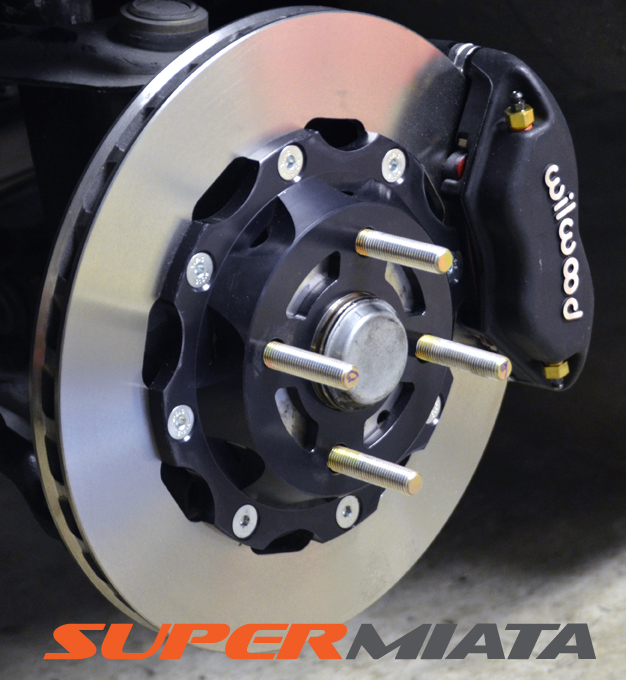 For 11" front BBK or OEM, we recommend the factory 94-00 rear brake setup. Completely my bad for muddying things up. I was confusing the 11.75 with the sport rotor. The above post makes it obvious as to how I ended up where I am. I have the Sport front, not the 11.75, making my '95 rear caliper and sport rotor and acceptable low end brake upgrade. Thank you Six for finding that quote, it saved me some searching while trying to figure out why I did what I did. Edit: I think mine is ok. Okay, I think I'm not really getting my point across all that well here. You're doing a few things when you swap to the aftermarket front brakes: I.e. bigger rotors than the sport brakes, and more powerful calipers, right? Thus, to balance things out, you need the sport rears which have bigger rotors and better calipers than the 1.8's. This, as everyone has said here, is an extremely balanced setup. I wanted to buy the brackets to use 1.8 calipers on sport rotors, which is what Ryan above had discussed doing and coupling this to the sport front rotors and calipers. I thought it was going to be an intermediate between even bigger rotors and power powerful calipers in the front, while also being an intermediate in the rear since the calipers aren't stronger, you just have slightly bigger rotors. I got confused because of what I saw with Ryan's setup and reading the script that sixshooter posted on the 949 site saying it wasn't recommended. Re: sixshooter, I understand what the best setup for a track car is. I'm looking for something better than the stock setup for the street. I bought sport fronts, but haven't installed them. 1) Don't install front sports. Instead just get better pads and/or rotors when you boost. 2) Install front brakes and calipers and keep rear 1.8's and perhaps get better pads/rotors for the rear. 3) Install front brakes and calipers, add 949 bracket to run 1.8 rear with a larger rear rotor to get slightly more braking from the rear and keep things proportional to the front. All these situations have me keeping the NB1 MC and brake booster. I know I'm new to this ****, but I'm trying not to be too daft about this. PS: I hope you're feeling better sixshooter! Basically, I wanted to do what ryan did above and was looking at the bracket 949 sells to do this with the 1.8 caliper as he did vs the sport caliper, which is better. I could (read:should) add the prop valve as well. I was curious if this was a balanced setup. Cliche, if you are on the street and on street tires you should find all the braking force you will need with the stock 1.8 brakes and better pads. Try the PFC pads. If you were running on the track with slicks you would want larger brake components and pads to keep up with the capability of the tires. Or if you were running on the track on street tires at greater than 200whp then you would certainly value an upgrade of the components also. The pitfall you want to avoid is having more rear brake capability than front. That's dangerous. In the rain you can spin. In a curve applying the brakes can make you spin. On cold tires it can make you spin. This is why Emilio recommends only upgrading the rears if the fronts have been adequately upgraded, and not before. If your option #2 is upgrading to sport fronts and leaving the standard rears, then great, but only if you already have the components. If not, your money would be better spent on good pads all the way around. If you haven't completely flushed and replaced the brake fluid in the last few months, I'd start there. It can significantly effect feel. If the caliper slider bolts don't fit snugly in their bores due to years of wear, that can effect feel (and contribute to pad taper). If you have 20 year old rubber brake lines, that can effect feel. If you have anti-squeal shims on the back of your brake pads they can effect feel. I fortunately or unfortunately bought the sport fronts already. I thought I got a pretty good deal on them, but I might sell them for what I paid if I end up deciding not to use them. I'm quite risk averse, so fixing the braking balance is pretty important to me. I think flushing brake fluid, using the sport fronts and potentially getting better pads and rotors for the front while getting new oem pads/rotors for the rear. Or even doing better F/R pads/rotors. This should help reset the balance and get it to shift more forward and decrease the probability of the situations you're describing. Point is that I definitely need to look over the brake setup since I haven't done so since I got the car. I think the brakes were done by the previous owner less than a year before I bought it, but I don't know exactly what all was done at that time.